This model transforms e-commerce by affording both urban shoppers and their rural family and friend’s greater choice, affordability and convenience when shopping for everyday items. Copia Kenya, a company that provides goods to underserved consumers in rural parts of Kenya through e-commerce, has this Thursday launched a new online shopping solution that makes it easier for people living in urban areas to buy goods and have them delivered to their friends and family upcountry. The new service consists of an e-commerce website that provides consumers living in urban areas of Kenya the ability to shop for products, ranging from; household goods, farming tools, electronics and construction materials, among other services. 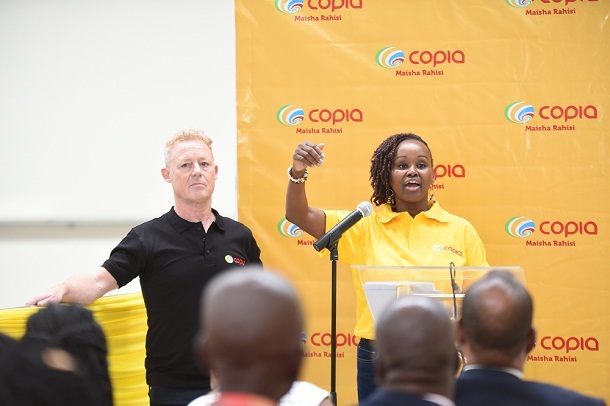 “Copia’s rapid growth in just five years shows the demand that exists among Kenyans in both rural and urban areas for digitally-powered solutions that make their day-to-day shopping needs easier,” said Tim Steel, the Chief Executive of Copia Kenya, during the launch of the product at Tatu City Industrial Park. The new online shopping service has been launched moments after the company moved into a new international standard grade-A logistics and distribution hub at Tatu City Industrial Park, located in Kiambu, a neighbouring County to Nairobi. According to a statement from the firm, the 4,000 square meters modern facility helps streamline the fulfillment of customer orders. And it will help facilitate Copia’s expansion into Western Kenya and other parts of the country. “E-commerce has the potential to transform Kenya’s economy while helping to uplift the living standards of millions of people. However, this can only happen if they are rolled-out with logistics and distribution solutions tailor-made to work for Kenya,” the CEO says.